Jodi Meadows has absolutely cemented her place in my list of favorite authors. Asunder was one of those books- you bloggers know what I mean. It was a book I couldn't WAIT to review, and then wasn't able to right away, and then the book released and I had to move on to my ever towering stack of books to review and left Asunder behind. Well, for my birthday I decided to pick a book I really wanted to read- and this was my pick! 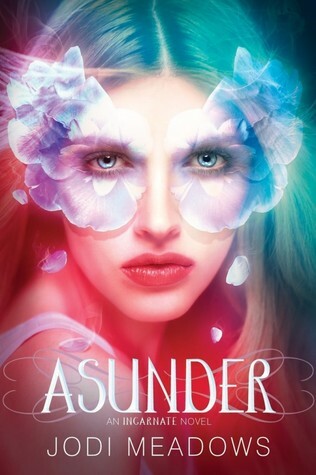 I thought I loved Incarnate (and although the masquerade scene still trumps all) I really loved Asunder even more. Incarnate ended with a pretty big bang and I was concerned that this second book would lag a bit- not at all. This book was non-stop action and drama. I am not even kidding when I say I have absolutely no nails left after reading this book. And Jodi? The babies? You are a cruel cruel woman for involving innocent babies. This mommy heart is going to explode from all the feelings. There are hints of a love triangle in this book, but readers will be happy with what happens- I found it to be ... hmmm I am not sure how to put it without including spoilers. It was shocking and excellent. There are HUGE developments about the history and the whys of this story- and I found myself seriously sad that the story ended. I cannot wait until the final book in this trilogy- Besides the gorgeous covers, I am really engrossed in the world that Meadows has created. I was enthralled and torn by the world created by Jodi Meadows when I read Incarnate. I am looking forward to finding more of a reading break in all my writing to finally get a chance to read Asunder. I need to make sure this is on my TBR list. I haven't read this series yet, but I heard this series is good. I want to read it soon. I haven't read this series yet, but it looks fabulous! Guess I'll have to check it out soon! I read Incarnate and it was a favorite of mine! I have the sequel and just need time to read it! Oh wow! Wonderful sounding book, now I have to put it on my "must read" list! Incarnate was a huge favorite of mine, and still is. It has been a while since I had the pleasure of reading it, but I still remember the story and the characters, and that is a huge thing with as many books as I read. I have not read Asunder yet, and after this review and hearing how amazing Jodi Meadows Sophomore showing is, I think I need to hurry it up already! I absolutely loved Asunder (and Incarnate, too, of course!) from start to finish! Plus, the covers are absolutely beautiful to look at! I haven't read this series, this is definitely one of those books where I'd read it because the cover is so amazing and intriguing. (Horrible, I know!!!) admit it though, we all do it!